A revolutionary new procedure, Platelet Rich Plasma (PRP) is now available to our patients suffering from hair loss. 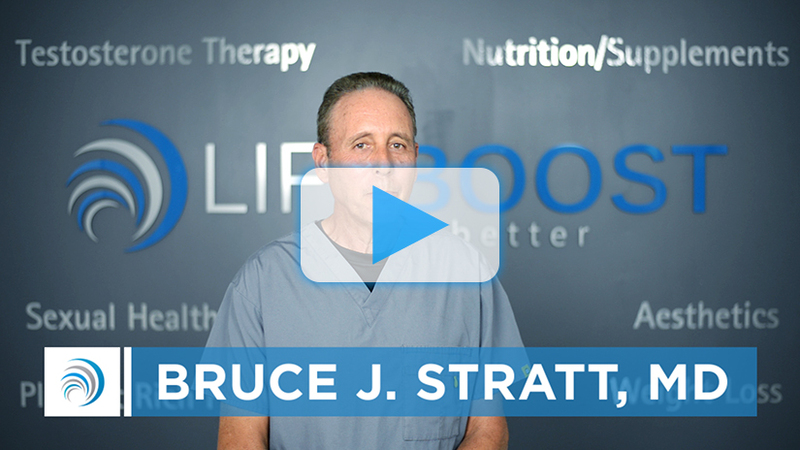 Located in Boca Raton, Bruce Stratt M.D. of LifeBoost is now offering Platelet Rich Plasma Therapy (PRP) To Stimulate Stem Cell Hair Regrowth and reverse the process of hair loss. PRP for hair loss is a natural hair restoration process utilizing platelets from a patient’s own blood and delivering them directly to the problem area to regenerate and regrow lost hair. “PRP hair restoration, also known as Platelet Rich Plasma Therapy, is an alternative to surgery and can be applied here in our office with little to no down-time,” said Bruce Stratt, M.D. with over 20 years experience and a leading proponent in this field. Losing your hair can be devastating for the man or woman who is suffering from any type of hair loss. Though it may appear that women would be more devastated than men, it is a hard pill to swallow for men who have enjoyed a healthy head of hair the majority of their lives. It’s just as hard or even more so for the young men experiencing hair loss at a early age. Hair loss happens to people for a number of reasons. It can be hereditary like premature greying. It can be caused by illness and/or stress. No matter the reason for the hair loss, the person who is suffering from it dreams and prays for the return of the days when they had a full head of hair. Losing your hair can be a self-esteem killer. Men and women alike do not feel good about their appearance when they look at their hair and notice bald patches or hair thinning. There are temporary ways to mask the loss, however, these temporary fixes can be time consuming, embarrassing, and in some cases they can do more harm than good. Hair plugs for men, wigs, and weaves for women can only hide the truth underneath the mask you see every day you wake up and look at yourself in the mirror. It is time to find a more permanent solution for male and female hair loss which is where PRP hair restoration comes in. Hair thinning is a condition where the hair thins slowly over time or begins to thin all at once. You may notice big clumps of hair in your brush or in the shower when you wash your hair. You may also notice an extreme amount of hair strands on your pillow or on your clothes. Though it is more common in men, about 40% of women suffer from this condition. In women, it can be caused by over 30 different medical and lifestyle conditions, most of which are hormonal related. Regardless of the cause for the thinning there is a way to stop thinning hair and a way to regain the hair you lost. If you notice you are losing your hair, it is advisable to come in for blood work to find out what the cause of the hair loss is. Once we have a clear understanding of what is causing your hair loss, we can work to find a solution to stop thinning hair and move towards growing it back. One solution to stop thinning hair is PRP hair restoration. PRP stands for Platelet Rich Plasma. PRP hair restoration is a great new alternative to surgery. It can be performed at our medical clinic in Boca Raton in about an hour. It is a simple procedure with very little down or recovery time. How Does PRP Hair Regrowth Work? PRP hair restoration is an all natural procedure. It is not pharmaceutical based. The doctor will take a sample of your blood from your arm, place it in a high-speed centrifuge to be spun to separate the platelets from the red blood cells. Once the platelets and red blood cells are separated, the PRP is injected into areas of the scalp where the hair loss is more evident. PRP for hair loss works in a simple way. The PRP is used to regenerate hair growth by stimulating degenerated follicles using the patience’s own plasma to do it. The inserted PRP wakes up the follicles and brings them back to life to promote new growth that is fuller, thicker, and grows in naturally. This is what makes PRP for hair loss one of the best alternatives for hair loss. It is done in a natural way by using something your body produces automatically. There are no drugs involved and PRP is an all natural therapy for men and women recovering from hair loss. PRP hair restoration is a quick outpatient procedure. You will receive a local anesthetic to numb the treatment area, you will receive injections throughout your scalp, and sixty minutes later you are done. The recovery time is almost as quick as the procedure. Patients can expect a recovery time of a couple of days. You can wash your hair immediately after receiving your PRP hair restoration therapy. Some patients may notice a little swelling around the forehead about four to six hours after receiving their PRP hair restoration treatment. This is normal. The swelling will dissipate in about 48 hours. Some patience have also experienced a little pain after their PRP hair restoration therapy. This pain can be managed with over the counter pain relievers such as Ibuprofen. For the most part, the recovery time is reportedly painless and quick. If you are one of the few patients who suffer from a little forehead swelling, it is recommended that you refrain from any strenuous activity until the swelling goes down. Now that you have discovered this amazing new treatment and have decided to go for it, how long will it take for you to see some type of hair growth results? On average, our hair grows about a half an inch a month. We lose about 80 strands a day on average that are regenerated through time. Our hair typically grows for about 2-6 years and then takes a rest. While in the resting period, new hair growth begins and eventually the old hair falls off and the new hair growth replaces the old. This is the natural cycle of hair growth. We have about 85% of our hair in growth mode at all times while the rest is in rest mode. A PRP hair restoration patient can expect to notice new hair growth in about two to nine months. Some can see a difference as soon as two months, but most see a change within six to nine months. They will continue to see an improvement in the growth of their as far ahead as a year after they have received PRP hair restoration therapy. Our hair is our calling card. It is a part of who we are. Some would say it is our crown. A bad hair day can wreck a woman’s spirit and tarnish her self-esteem. Male patterned baldness can make a man feel unattractive. Everyone wants a permanent solution to their hair thinning problems, but they do not all want to go under the knife to stop it. PRP hair restoration therapy is the solution everyone has been waiting for.